Members and friends of the Northeast Lafferty League (NELL) gathered in Lawrenceville, New Jersey for the second annual celebration of the life and works of R.A. Lafferty on June 10, 2017. 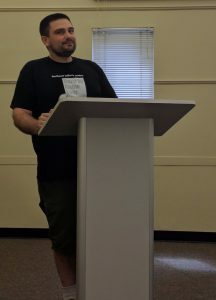 Attendees were encouraged to read the novel Fourth Mansions, as well as the short stories “Pani Planet” and “Thieving Bear Planet” in advance, preparing them for a series of in-depth lectures and panels. 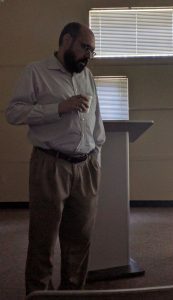 Kevin Cheek started things off with a talk on the character and plot development in Fourth Mansions through repeated memes, with a particular focus on the use of animal archetypes. 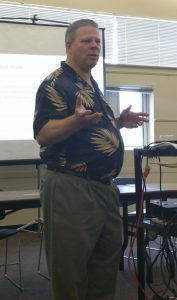 He also traced connections to Greek myths within the text, discussed the techniques used to pack big ideas into such a brief story, and spoke about the overall sense of hope the book manages to convey. Next, was Gregorio Montejo’s scholarly perspective on the novel’s influences in the sixteenth century writings of St. Teresa of Ávila. Using paintings by Spanish surrealist painter Remedios Varo as a backdrop, he took a stroll through theological themes and recurring motifs to show the richness of these intertwined pieces. After a lunch was a panel on interpreting Lafferty visually with artists Lissanne Lake, Anthony Ryan Rhodes, and Yakov Varganov looking at book cover designs from various printings around the world. They also exhibited story inspired art pieces by those who imagine the bizarre in paint brush, pencil, and digital stylus. Examples of this wide array of original art were on display at the venue, with realist acrylic paintings hanging beside Sunday morning comic strip style cartoons featuring scenes pulled straight from the text. 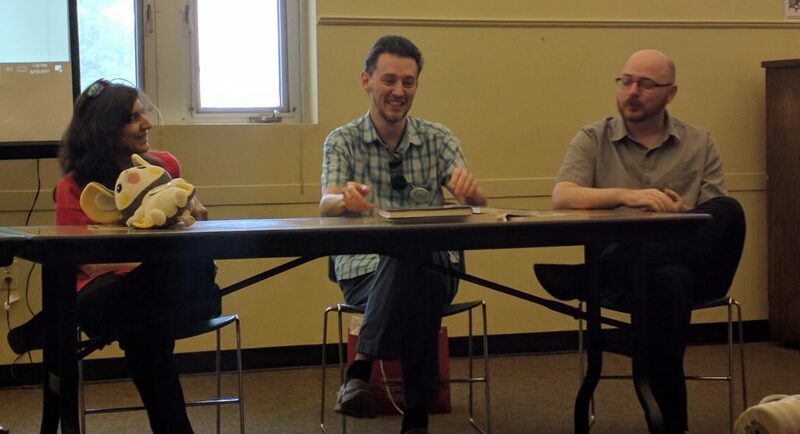 The art panel was followed by a review of the translation and reception of Lafferty outside the US with Gregorio Montejo, Tairiku Ronin, and Yakov Varganov, explaining how Spain, Japan, Russia, and other foreign markets have latched onto a distinctly Oklahoman voice. They also touched on the factors that made this speaker known around the world, even as he remains relatively obscure in his home country. 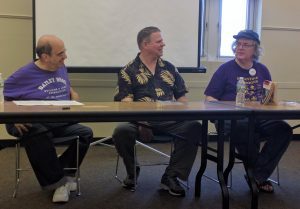 The convention concluded with a group discussion on short stories lead by Samuel J. Tomaino, Kevin Cheek, and Darrell Schweitzer, with thoughtful contributions from longtime readers in the audience. Thank you for posting this! Thank you to the members of the NorthEast Lafferty League for toiling in the midnight oil to make this all happen! We hope next year’s LaffCon will be even bigger and better. They haven’t announced which book and stories to focus on for next year, but they may be open to suggestion. Check out LaffCon.org, and check back every couple of months to for announcements about LaffCon 3! Excellent review, James. It was a terrific event. Thank you!